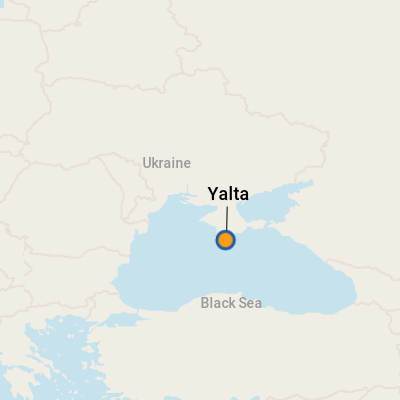 Editor's Note: Due to ongoing issues in the Crimean peninsula, stops in Yalta have been halted by most cruise lines. Jutting out into the Black Sea, lined with beaches and at the same latitude as southern France, the Crimean coastline has been dubbed the Ukrainian Riviera. Yalta ranks as the largest and most popular resort town on this stretch of coast. Set in a deep bay and surrounded by green mountains and vineyards, it's certainly easy on the eye as you sail toward the shore. Yalta has been shaped by many influences over the centuries. 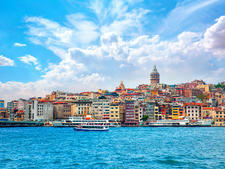 According to legend, it was founded in the 1st century by Greek sailors who lost their way in a storm. When they landed in the bay with its warm climate and beautiful surroundings, they decided to stay put and form a settlement. The old part of town contains wooden houses built under Turkish rule in the 18th century; Russia took control in the late 18th century. Yalta quickly became the Black Sea's most fashionable resort and a playground of the czars and aristocracy when Alexander II made nearby Livadia his summer home. Its balmy climate and seaside location led to Yalta becoming a health resort for Soviet workers in the 20th century, with grand homes turned into sanatoria. For cruise passengers making their way on land under their own steam, it's easy to see why many don't get any farther than the long stretch of promenade named after Lenin (and where his statue gazes out to sea). Situated next to the cruise terminal, the waterfront is well over a mile long and lined with interesting shops and places to eat and drink. The rest of the town is not as accessible as main districts in other Black Sea ports, such as Odessa. The roads are quite steep and often busy with tour buses and taxis leaving the port. However, Yalta is the gateway to a fascinating region. Beyond the town, winding roads offer spectacular views of the coast and lead to evocative Crimean War sites and palaces that played a pivotal role in modern history. Cruise ships dock at Yalta Sea Trade Port, which contains a passenger terminal. 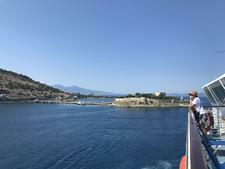 The port is situated on the main promenade but, unlike other Black Sea destinations, most of the main sights, such as Livadia, Alupka Palace and the Crow's Nest, are not accessible on foot from the port. Visitors need to sign up for shore excursions or travel independently by taxi. In 2012, plans were announced to modernize the port and extend the berthing facilities to accommodate up to four ships simultaneously. The passenger terminal features a tourist information office and facilities, including toilets and refreshment vendors. There are ATM's on the pedestrian-only waterfront area and plenty of shops, restaurants, open-air cafes, fairground rides, street entertainers and pebble beaches, making it easy to enjoy a day close to the port. Historic sights include the statue of Lenin standing in front of a modern fast food chain. A case of the old East meeting the new West? Plenty of taxis can be hailed around the port, but make sure you agree on a price before you get in. Don't be afraid to haggle. If you think the price is too high, just walk away and find another taxi down the street and try to negotiate a cheaper rate. On Foot: Away from the bustling Naberezhnaya Lenina, or Lenin Promenade, the main city center is a 15-minute walk away -- where a top attraction is Alexander Nevsky cathedral. Independent travelers armed with a map can enjoy a stroll from the port to soak up some of the sights, but for the main attractions, you need to take a tour bus out of town. Public Transport: Inexpensive trolley buses travel in town, and a good bus network runs to outlying areas that are home to attractions such as Alupka Palace and the Crow's Nest. Tell the driver where you want to get off because the stops are a short walk away. Bear in mind that language can also be an issue. By Taxi: Taxis are plentiful, and drivers waiting outside the port terminal invariably speak English, and they know all the top sights and how to dodge the peak-season traffic jams. By Ferry: During the cruise season, up to 20 ferries a day run from the pier on the promenade to the Swallow's Nest and Livadia Palace. Tickets are cheap, but be prepared for the climb up to the castle and palace from the landing points. Cruise ships typically arrive at breakfast time and sail late afternoon, so there is plenty of time for travelers to go sightseeing on their own. The currency is the Ukrainian hryvnia. For current currency conversion figures, check www.xe.com. Some souvenir vendors in Yalta accept U.S. dollars, but it's best to get some local currency; U.S. dollars and Russian rubles represent the two main currencies accepted at banks and money exchanges. Some exchange services accept euros, and the British pound is hard to exchange. Ensure notes are in good condition or they could be refused. A currency exchange is located in the port's passenger terminal, and you'll find plenty of ATM's nearby. Major credit cards are accepted in restaurants and shops. Ukrainian is the official state language. English is widely spoken in shops, restaurants and at tourist attractions. Yalta offers international restaurants and fast food eateries that will appeal to all tastes, along with plenty of local specialities. A typical lunch is pelmeni, steamed dumplings filled with meat, and Crimea is famous for its red onions, which have a sweet taste and are considered something of a delicacy. You'll find plenty of fish dishes on the menus, and don't forget to try some local wine or maybe a shot of ice cold vodka. Many restaurants catering to tourists are clustered around the port area and serve decent, if not gourmet, food. Edible souvenirs represent a good buy. The Ukraine is known for its honey, and vodka is cheap, plentiful and comes in all sorts of flavors. 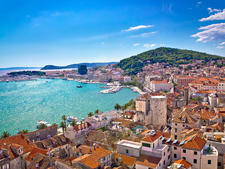 These items, along with the national delicacy caviar, can be found in the souvenir shops near the port and at the stalls around the Livadia Palace and the Swallow's Nest lookout point. Hand-painted wooden crafts, paintings of local views and embroidered clothing and linen make more lasting mementos of time in Yalta.